The National Masters meet turned out to be as I had hoped for, full of fun and good experiences. 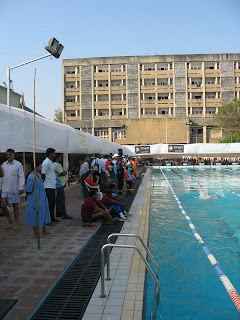 The swimming events of the National Masters Aquatic Championships were held at the Andheri Sports complex and were very well organized by the Greater Mumbai Amateur Aquatic Association (GMAAA). 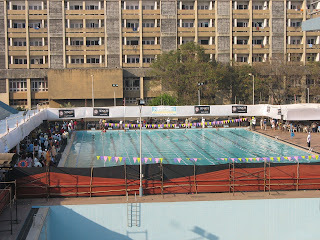 Considering that there were 650 swimmers from all over the country participating, the organizers did a great job of ensuring that the events were conducted smoothly. 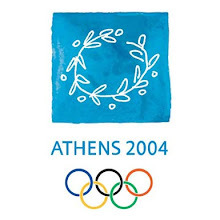 It was quite a nostalgic experience for me as it was at the same pool that I swam my last Senior Nationals in December 1999 winning the National title in the 100 and 200m Freestyle. It felt great coming back to the same venue after 8 years to swim another National in a different league and reclaiming the 100 and 200m Freestyle. 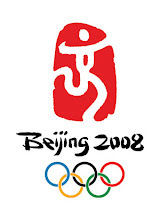 I finished this meet with three individual gold medals – 100, 200 and 400m Freestyle – and one gold and one silver medal in the 4*50 Freestyle and Medley relays respectively. 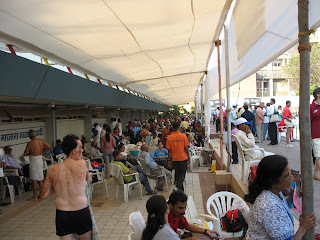 In the latter, the parents cheer and pamper their kids while in the former the kids, and a few grand kids, were seen cheering and pampering their parents and grandparents. In the latter the times get faster as we go up the age groups while in the former the times get slower. In the latter the priority is winning first and fun next while in the former it is fun first and winning next. Mr. Krishnamurthy, the Nonagenarian (90yrs+) from Karnataka, was one of the stars who stood as a shining example that one is never be too old to compete. Taranath Shenoy, one of the legends of long distance swimming who is visually challenged and has been awarded the prestigious Padmashree, was another star who displayed his swimming prowess by creating multiple records. As a kid, I had heard a lot about Taranath Shenoy and it was my pleasure meeting him and having the honor of awarding him a medal for one of his events. 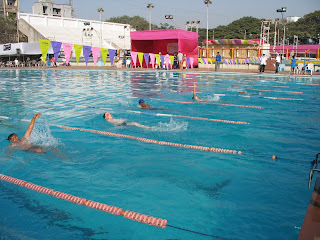 Taranath was among a handful of physically challenged swimmers who participated shoulder to shoulder with the able bodied and showed that they were a force to be reckoned with. Overall it was fantastic experience and I look forward to the next Masters Nationals. For those who swam faster than the FINA World Masters qualifying time, and can afford to fund their own trip, the next stop is the FINA World Masters at Perth (Australia) in April this year (Check earlier blog post for the handbook on the World Masters). Click here for the results of the individual events.